Bring the Crunch is part of the South Park: The Fractured but Whole Season Pass. Get it now to access all the game's existing and future additional content. 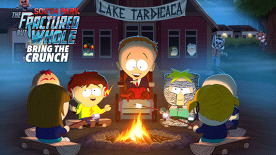 AN ALL-NEW STORY FROM THE CREATORS OF SOUTH PARK - Explore new areas and fight new enemies at Lake Tardicaca. NEW BUDDY – MINT-BERRY CRUNCH - Bradley Biggle, AKA Gok-zarah, arrives from his planet with the power of mint and berries. NEW FINAL GIRL CLASS - There’s always one girl that survives every scary movie. This new class embodies that guile and resilience.